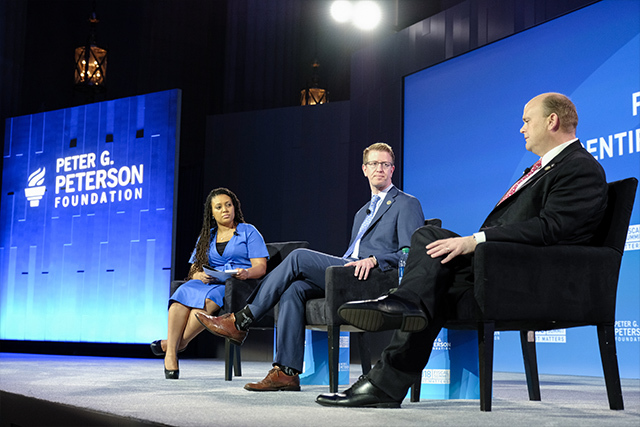 The day's first panel brought together two leaders from the Problem Solvers Caucus — a unique, bipartisan group in the U.S. House of Representatives that seeks areas of common ground. Representative Tom Reed (R-NY) and Representative Derek Kilmer (D-WA) joined Marketplace Senior Reporter Kimberly Adams, the moderator, to discuss the political challenges in reaching across the aisle as well as the opportunity that exists for collaboration and compromise to make progress in critical policy areas. Both lawmakers agreed that the problem is not a lack of policy options, with Reed noting that “All the experts know what the solutions are. … It’s some sort of balancing revenue with spending reforms.” He predicted that if a “grand bargain” comprehensive fiscal reform package were brought up for a vote, there would be sufficient support in the House and Senate.